This morning Reuters published the results of the new survey by polling company Ekos puts the NDP at 29.2 percent support, the Conservatives at 28.6 percent, and the Liberals at 27.6 percent. Rueters said: "Canada's left-leaning New Democratic Party (NDP), which stormed to victory in a provincial election in conservative Alberta this month, has vaulted from third to first place in national support...". 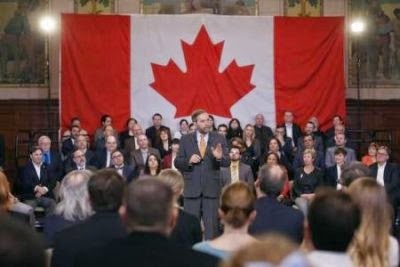 Seems 'the times they are a changin' fast and the fearful corporate owned mainstream media doesn't know what's going on in the minds and hearts of Canadians. 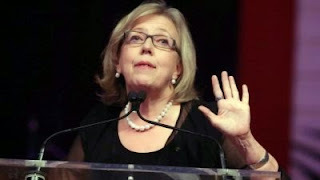 Another example is the MSM's immediate and reactionary response to Elizabeth May's speech denouncing the harpo regeme's bigoted attempts to use Omar Khadr in its ongoing fear-mongering campaign. Almost as quickly as the MSM denounced Ms. May the social media and blog-o-sphere erupted in support of her and her appraisal of Omar. For instance, during Evan Solomon's CBC interview of 'Elizabeth the Bigot Slayer' in which he attempted to score his own points against her his social media accounts lit up with Canadians angry at Evan aggressive questioning not Elizabeth's responses. Further only 10 per cent of respondents to a Power and Politics survey on Monday's episode thought the speech would hurt May politically, while 89 per cent said it would not. That survey with 89 percent of respondents saying this will *not* harm Liz May's political career is a better sanity-check than all those preening, self-annointed PR experts combined. According to the litmus test of CBC comments, a sizable plurality of popular opinion agree that what she said was 100% correct, bad joke or not. Then there's the fact that not only have harpo's numbers plummeted recently, but so have the Liberals'. Apparently Trudeau's fork tongued support of Bill C-51 - The Secret Police Act - has turned Canadians off from coast to coast to coast. Polls will be polls, i wouldn't be sticking a fork in harpo just yet, but as one friend said in an email earlier, "This one is a ray of sunshine on an otherwise rainy day here in southwest BC".